Brahm's Yellow Dots: The Procedure. Anyone who knows me will know that science is a pretty big part of my life. It would be important to catalog Lexmark's requests so that I could repeat any experiment if need be and produce the same results. Figure 1: Control Print, Default Setup (click for large). As you can see, with a bit of tweaking in Photoshop, the dots pop out and are quite visible. Figure 2: My Photoconductor units. 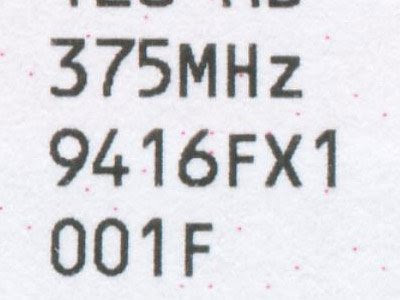 The serial numbers are all visible, should you choose to enlarge this image! Figure 3: Photoconductor swap results. The yellow dots are still present, and have not turned magenta. According to Lexmark, the "problem" is not the photoconductor unit! The support email goes on to say that "If the issue stays with the same Yellow then the Toner Cartridge is defective, the Toner Cartridge needs to be replaced to fix the issue." Luckily, there is an easy way to prove this hypothesis wrong: swap the toner cartridge. Figure 4: The yellow and magenta toner cartridges have been swapped. Any predictions for what will happen? 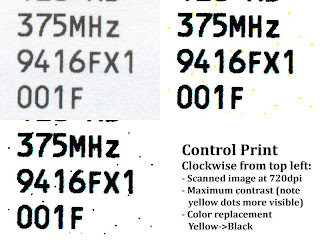 Figure 5: A scan of the Print Quality Page after the yellow and magenta toner cartridges have been swapped. Note that tiny magenta dots are clearly visible everywhere on the page! This image has not been manipulated, except to crop it to a smaller size. By Lexmark's definition, BOTH of my yellow and magenta toner cartidges appear to be "defective". I wonder what would happen if I tested my black and cyan cartidges in a similar manner... I am sure they will be "defective" as well. Yellow dots are NOT dependent on a photoconductor unit. Dots appearing are NOT dependent on what color toner cartridge is inserted. Dots WILL appear from whatever cartridge is inserted in the yellow toner's spot, on any color document printed. There is NO WAY to disable the yellow dots in any Lexmark menu or manual. 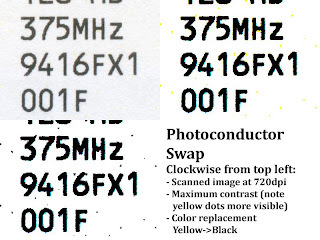 Based on information collected from other websites, it has been proven these dots contain information like your printer's serial number, and the date and time your document was printed. Here is the last piece of information Lexmark wanted - my Menu Page Settings reports. I've inlcuded them here for the internet's reference. Figures 6, 7, 8: Printer Settings.